When it rains, it pours – but it can’t rain all the time. I have been told that Italians are supposed to be upbeat, optimistic people; artists and dreamers who know how to have a good time while eating a whole lot of pizza and playing the mandolin and gesticulating and so on. You know that American film cliché – the stressed, workaholic New Yorker goes to Italy (well, I say Italy, I really mean Tuscany, Rome or Venice. I’d like to see a character go to Molise for once) She eats copious amounts of food, strolls down the colorful narrow streets, has funny exchanges with the pictoresque locals who always have a moustache and finally learns how to relax and have a good time (I’m looking at you, Eat Pray Love).That’s because Italians are never stressed. They are ridiculously happy at all times. It’s the sun, you know, vitamin D and all that. What’s funny is that I don’t remember ever being surrounded by optimism. Growing up in Rome in the Naughties was just a lot of people telling me to dream smaller. Every family dinner would end with endless conversations about how our country was beyond saving, how my generation was going to pay the price, how we were never going to find a job and we would be better off just leaving Italy. And then the inevitable: “si stava meglio quando si stava peggio” (things were better when times were harder). Luckily, my mum did her best to prevent me from becoming a bundle of pessimism and depression, with her calm, sound belief that everything happens for a reason, things are the way they are meant to be and everything will work out in the end. She only partially succeeded. My grandad’s favourite phrase was “be careful and don’t trust anyone”. I was going out with a boy? Be careful and don’t trust anyone. Cinema with friends? Be careful and don’t trust anyone. Holiday? Be careful and don’t trust anyone. Moving abroad? Well that was one long conversation. My grandad had emigrated to Argentina when he was young and engaged to my grandma. He had liked it there, he often said it had been a lot of fun – but always felt like it wasn’t his decision to leave. He did what he had to do, but never stopped longing for Italy. Of course, Argentina in the 50’s is nothing like Britain right now. He shared a room with seven people and they had to top and tail every night. He worked hard. He missed all the little things – food, films, saying hello to people in his own language – but was filled with wonder when he saw the first shopping centres. He was a tenor for a bit, apparently (his stories about Argentina were often fragmentary and somewhat contradictory. I sometimes think half of them were true, and half figments of his imagination. A Big Fish type of thing, but less Tim Burton-y). When I told him I was moving abroad he cried a little. He just couldn’t understand that I like it here, that it was my choice to move, that you can buy mozzarella even in Britain. He told me to be safe, to be careful, never to trust anyone. He said the world was dangerous and dark and dismal. He was probably the least optimistic person I know, yet somehow he was always cheerful, and he would bring ice cream every time he came for lunch, even in the winter. He was convinced we loved this one particular kind and we never corrected him, even though it wasn’t exactly our favourite. I remember him as being always angry when I was little, but he slowly turned into the most loving, gentle old man. He would make huge bowls of fruit salad with sugary canned fruit even though my mum didn’t want my sister and I to have all that sugar. She’d ask him “is it fresh fruit this time?”, and he’d nod and then wink at us. I still really, really love canned fruit, all sugary, colorful and plastic-y. But optimism, well, that doesn’t always come easy. 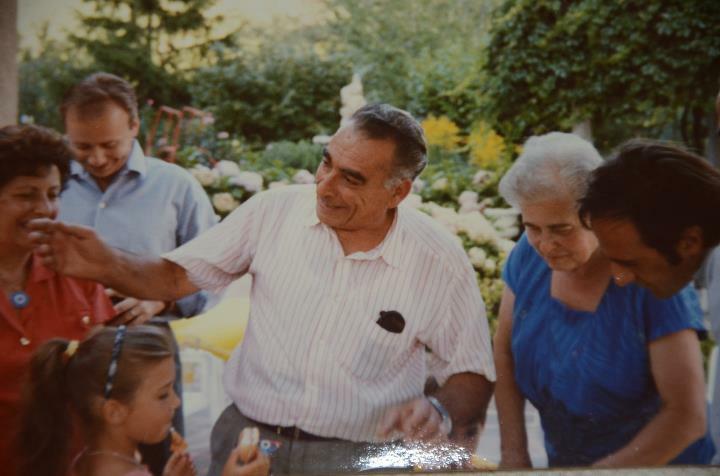 My grandad, my grannie and me in the corner, eating as per usual.